Text from the mini print catalogue provided by Good Press at the occasion of “That’s life” event.This tape will have a new life being released by Human Sacrifice very soon ! Olivier di Placido & Crank Sturgeon / Diktat / Phil Julian/Kostis Kilymis (3” CDR) on Coherent States ! “3″ CDR housed in custom-made mini-digifile, including exclusive studio tracks by Olivier di Placido/Crank Sturgeon, Diktat and Phil Julian/Kostis Kilymis, available for free only to the very first ones to purchase the CS6, CS7, CS8 batch. No streaming or download will be available for these tracks! Only one copy per person! Purchase here. SOLD OUT!!! Olivier di Placido & Crank Sturgeon “Twice Heathen Scent” (C30) on Coherent States ! You know Crank Sturgeon, don’t you? Ηe is an significant experimental noise musician and performance artist from the States. Apart from that, he is the guy behind the track entitled “Careening On The Idyllic Orifice After Once The Templ Is Built And All Knobs Are Turning All Decks Sun Backed In Clay And Transmittting The Endearing Hole”. Armed to the gills with thrift store electronics, supermarket aesthetics, and ample saliva, Crank Sturgeon implements these tools as a means to explore the unwieldy commingling of noise andperformance art. The result has been a double-decade, multi-hemispherical odyssey of blastingmishaps and primeval happenstance, taking the shape of inflatable parades, unlikely orchestras, and amplified badminton games; spawning amalgamations with other like-minded artists such as Fritz Welch, Id M Theft Able, and Patrick Corrigan. Olivier Di Placido is a french quitar player. Although this might not be descriptive enough, as he treats the organ in a more unique and creative way, being able to play it like a turntable, a synthesizer or a gamelan orchestra. Interested in discovering all the possibilities of the guitar, including the most hidden ones, Olivier has litterally invented a new and hybrid instrument, with unfixed neck and moving pick-up. He works with several projects with Mario De Vega, SEC_ (check the “Rainbow Grotesque” LP on Bocian), Fritz Welch, the Many Others group and of course Crank Sturgeon. 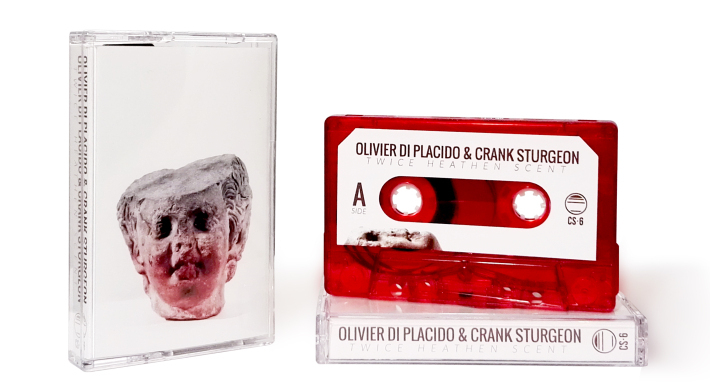 On “Twice Heathen Scent” cassette, Olivier Di Placido and Crank Sturgeon form a transatlantic partnership by merging their individualized practices in experimental sound and improvisation. Using a motley array of guitar pickups, found objects, and voice, the duo’s approach is both surgically precise yet unbridled and involuntary. The effect is not unlike a ferris wheel loosened from its hinges: ensnaring the listener in a tumbling motorcade of hiccups, shortwave frequencies, and primordial noise. “Twice Heathen Scent” is a studio tape, recorded right before their “Twice Heathen Scent” European Tour in late 2015. And yes, it is a pity that the tape that gave name to the whole tour wasn’t available at the merchtables of the 20 cities they visited. Olivier: broken guitar, magnetic pickups, cymbal, table desk, ebows and editing. 30 hand-numbered translucent green cassette tapes (C30) with full colour labels and 4pp j-card covers on 150gsm paper.